Overall, it was clear that students see STEM as an opportunity for a better future. After the program, students demonstrate a better grasp of the STEM skills required to pursue desired career paths. It’s been 30 years since Jeff Loftis was a student at Hayes Middle School in Charlestown, West Virginia. In the same room he sat as a student for his required sewing class, Loftis is now teaching critical science, technology, engineering, and math (STEM) skills through the U.S. Chamber of Commerce Foundation’s digital STEM Scholars program. Yesterday, we celebrated Loftis’ students, who recently completed the program, and asked them to reflect on the impact of learning about STEM skills and careers. For these students, STEM is an opportunity for a better future. During our discussion about careers at the March 27 event at Hayes Middle School in West Virginia, many students indicated a desire to be a doctor or a veterinarian - careers traditionally popular among middle school-aged students. Loftis’ class, however, knows what it takes to get to these popular career choices. After participating in the STEM Scholars program, students demonstrate a better grasp of the STEM skills required to pursue these careers. Admittedly, many students noted that they were unaware of STEM careers prior to this program, and would likely have not explored STEM opportunities had Mr. Loftis not included this as a required part of their curriculum. Aside from being pleasantly surprised by the program’s level of fun, the students remarked that the program was a challenging, engaging way to learn. John Canfield, special guest from the West Virginia Chamber of Commerce, learned this firsthand during the group discussion portion of the event. Students were eager to share their key takeaways from the program’s three modules: the data analysis behind creating the perfect playlist, the problem solving skills required to calibrate a connected home, and the engineering skills needed to properly manufacturer sneakers. 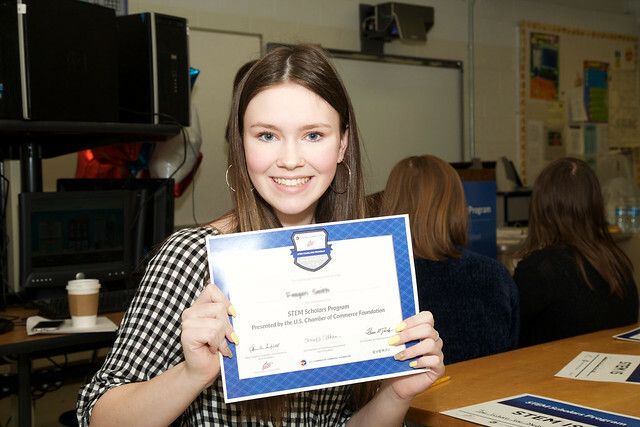 Enjoy some photos from this year's event at Hayes Middle School and let us know if you would like to partner with the Chamber Foundation on future STEM initiatives at education@uschamber.com.